Hagia Sophia in Istanbul is one of the most famous buildings in the world — first a Greek Orthodox Church, then the Ottoman Imperial Mosque, and now a museum. 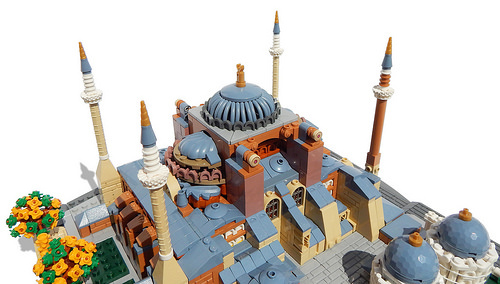 Despite its reknown, its distinctive collection of domed, sloped, and circular construction is surely an intimidating subject to recreate in LEGO bricks. However, Rocco Buttliere — the undisputed master of LEGO architecture — appears up to the task. The attention to detail that’s gone into this model is impressive, and the parts use is a masterclass in how to give a LEGO creation depth of texture. Don’t miss the use of Shakespearean-minifigure neck ruffs as flourishes on the surrounding towers, battle droid feet employed as arched windows, and the masterstroke of using hot dog sausage parts for the central dome! 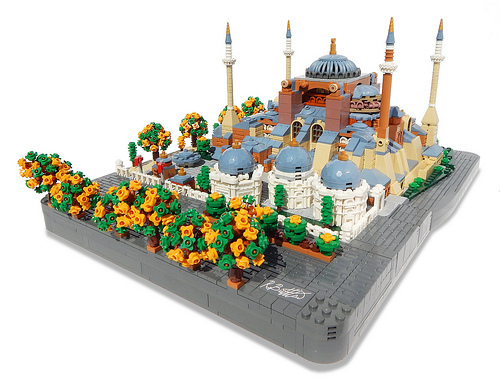 This is a great example of imaginative building to show anyone who ever says LEGO parts are getting too specialised nowadays. “Despite its reknown,” I think you meant renown? Also I love the use of unicorn horns. Looks just like Jabba’s palace.